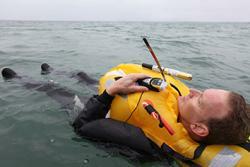 The safety equipment manufacturer will supply 16,000 personal locator beacons to the USCG over the next five years. LSA manufacturer McMurdo has scooped a major contract, valued at US$3 million, to supply the US Coast Guard (USCG) with personal locator beacons (PLBs). The award is for an indefinite delivery / indefinite quantity contract, covering a base year with four one-year options. McMurdo estimates that it will provide the agency with up to 16,000 of its FastFind 220 PLBs over the next five years, to safeguard USCG crew in the event of marine emergencies, such as man overboard (MOB) incidents. The FastFind 220 model uses the 406MHz frequency and transmits an emergency distress signal, containing both the wearer’s unique beacon ID and his/her present location, over the Copsas-Sarsat international SAR satellite system. The signal is then relayed to regional SAR authorities, enabling first responders to swing into action. Typically supplied with a buoyancy pouch and waterproofed to 10m, the FastFind 220 measures 106mm in length, 47mm in width and 34mm in height, with a weight of 152g.